Click the button below to add the Strawberry No Sugar Added Spread to your wish list. The fruit tastes so fresh in these no sugar added jams. Chunks of whole strawberries makes this thick jam a sure winner. 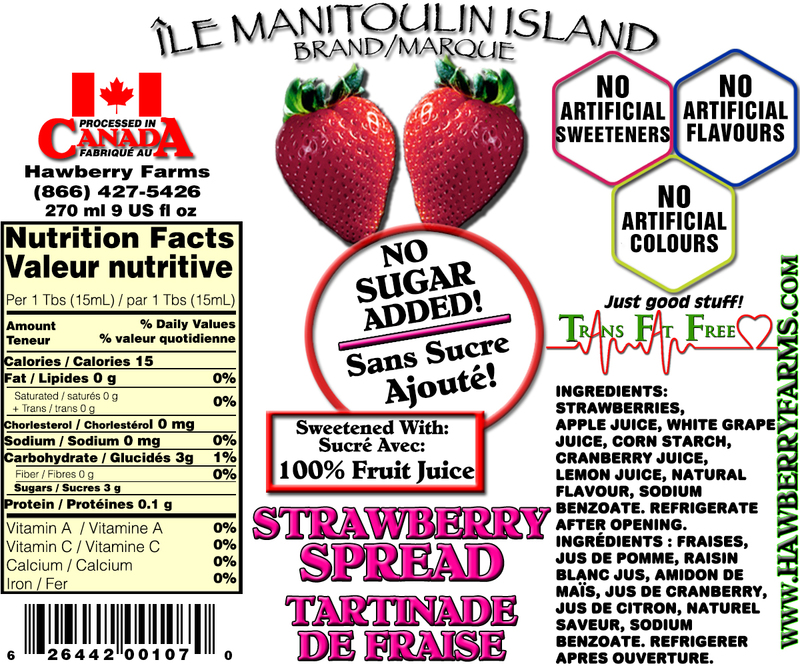 Ingredients: Strawberries, apple juice, white grape,juice, corn starch, cranberry juice, lemon juice, natural flavour, sodium benzoate. I believe it's been 100 jars consumed to date! He tried other no sugar added jams and loved yours. He doesn't use any other spread for his favourite snack. Thank you for your continued supply. About as good as it gets with no-sugar preserves. Not all the fruit flavors are this good, but rasberry and strawberry sure are.